So, say you've been rolling along with this homeschool thing for years... You've managed to teach the kids to read, had a blast doing hands-on projects and engaging unit studies, and managed to max-out the educational value of even your most-fun vacations. Arriving at the middle school portal, you've tweaked your approach and curriculum to their learning style, when all-of-a-sudden, it's here. High-school looms around the corner! "Oh no," you think, "now what?" 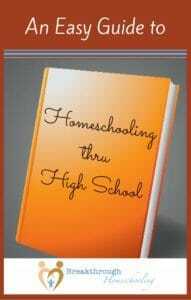 Many families who started homeschooling when their kids were young weren't necessarily thinking this far down the road. As a matter of fact, many parents I know - myself included - started homeschooling with the intent of sending their children back to "the system" when high school arrived, intending, of course, for them to get a "real " education. Well, I think I can also say that by the time these years roll around, these same parents realize that the "real" education is not to be had "out there." But it still begs the question "How do I handle high school?" Let me present a different approach to that subject. 1. I know many adults that could benefit from this talk. This goes far beyond the public speaking course that your student may be required to take their freshman year - this is character training that describes a true life skill. 2. Dealing with frustration is part-and-parcel of life. In our culture of immediate gratification and internet-instant information, if our kids can learn how to creatively deal with the "unexpected advantages of dealing with a little mess"....well, can you just imagine?!? 3. How awesome it would be to see your own son or daughter become an inspirational leader in years to come! 5. Face it: the world is full of liars and hoaxsters. Knowing how to recognize them can help your student be "in the world, but not of it." Don't have time to watch all these videos now? 6. This guy is a great speaker! We, too, might need to change the way we define happiness and success. The "happiness advantage" works to give us advantages on oh-so-many levels... He also presents some practical, real-life activities to incorporate to re-train our counter-productive thoughts patterns. 7. This talk - given by an absolutely gorgeous model - is totally relevant for both our sons AND daughters. It's so important to deal honestly with the issues of appearance, femininity, race, beauty, and image. (Note: there is some "skin" and suggestive poses from her own modeling shots in this, so you may want to preview it before showing your sons. But the message...oh, the message...) Make sure you talk about this one together - it's great fodder for discussion! 8. He describes a fascinating Harvard study started in 1938 that tracks the correlation of relationships and, well, life. His lesson is simple and true. 9. Our kids are under such pressure to succeed. Encourage them to take note of the "scrapper's" characteristics here. However you define the concept of success, this is so encouraging to anyone who struggles with adversity. 10. Practical, scientifically-based insights and suggestions to help minimize stress in your life. Your teen may not be able to identify with some of the examples given, but in those cases, you may want to have a post-video discussion of some of his or her current stresses, or suggest some that might come up during college or their new job, or in future relationships, or...and how they might deal with them ahead of time. It bears repeating: these aren't the type of videos to have the kids watch while you go fold laundry. These are all watch-'em-together and talk-about-them-afterward videos. Use them to engage with your teen! What other qualities or character traits do you think are important for your child to learn as he or she prepares for life after high-school? What other TED talks would you recommend? Share them in the comments! You may also be interested in taking a look at the companion post to this: TED Talks for Aspiring Student Leaders. What a great listing! These all look so interesting! Yes, Joanne, they are! I have to admit that I didn’t agree with everything I heard, but overall the messages were sound – and important! I wish I knew HALF of this stuff when I was starting out. Our kids will have a real advantage in life just working through some of this material…and when placed in context, in a discussion with parents…well, just wow!! Well, I hopped over here from The Art of Home-Making Mondays…and felt like I’d come home! 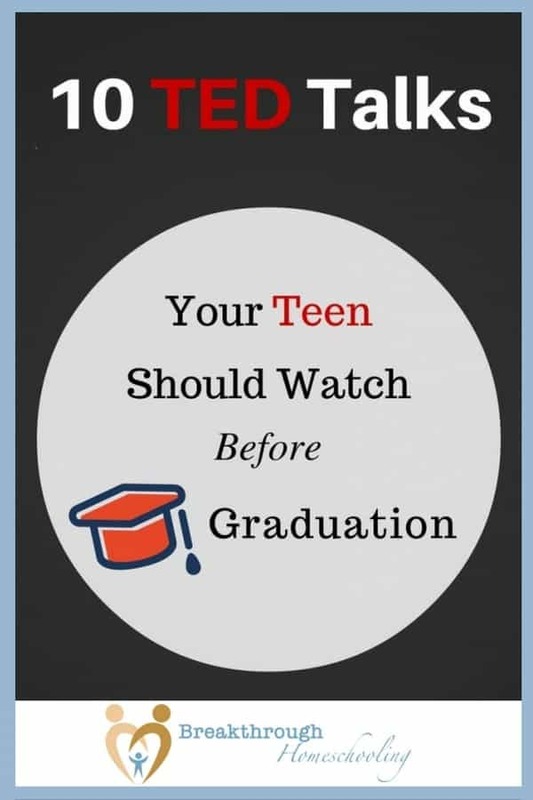 🙂 I am still rather shocked that I have to pay attention to posts about things my teen needs to do/watch/read/learn/experience before graduation BECAUSE I HAVE A TEEN WHO WILL BE GRADUATING NEXT YEAR. Breathe…just breathe. But thank you for this helpful reference. I’m a little worried that I’ve never heard of TED, though. It makes me wonder what else I’ve missed. (Cue Learner Child Mistakes.) Thanks for sharing this wisdom! Elizabeth, SO GOOD to see you again!!! Can’t believe you have a graduate next year, too!! How fun – and crazy and unbelievable, too, right?! Love these! These are absolutely amazing! So very perfect to illustrate the points listed. Thanks so much for sharing these. I have passed them along to our daughter who home schools. These sound AMAZING! I can’t wait to start watching these with my boys. Great suggestions! Thank-you! My kiddos are only 3 and 5 but graduation will come quicker then I think. What a great resource. Thanks for linking up at Family Joy Link Up this week. I am so sheltered! I had never heard of Ted until last week. I think I need to change that. Thanks for sharing on Thursday Favorite Things. Pinned and shared. I’m arriving late to this conversation, but I totally agree with sharing TED talks with your children. My all time favorite – I absolutely love it and it’s required watching for my children – is Ted Urban’s ‘Inside the mind of a master procrastinator’. Dawn – better late than never! AND…I took a look at Ted’s TED talk, and thought it wonderful myself! So I’m including the link here and suggesting it as a #11. Counter-cultural in many ways in that it goes against all the advice we hear given to young people about following their passion. Even if we don’t agree with everything, it’s good to hear something from a different perspective. What a great “add” to this list! My husband has been saying for years that one of these days plumbers and electricians and carpenters will be able to bring in the big bucks…’cause everyone else will be in tech, and who’ll fix the toilets then?! Oh My Goodness! I already had my list ready to go for teaching a TED Co-op class then I find your list. Now what do I do? Haha! Thinking I may skip the paperwork I was going to have them do and just watch them all. We learn better that way anyway, right? In case anyone is interested, these are the ones I found. I found that if you look on Youtube for it, you get better results than looking on the TED talk webpage. Go figure. I will SO be emailing you for more info on your class, Sherri! Thanks so much for your comment and contribution! 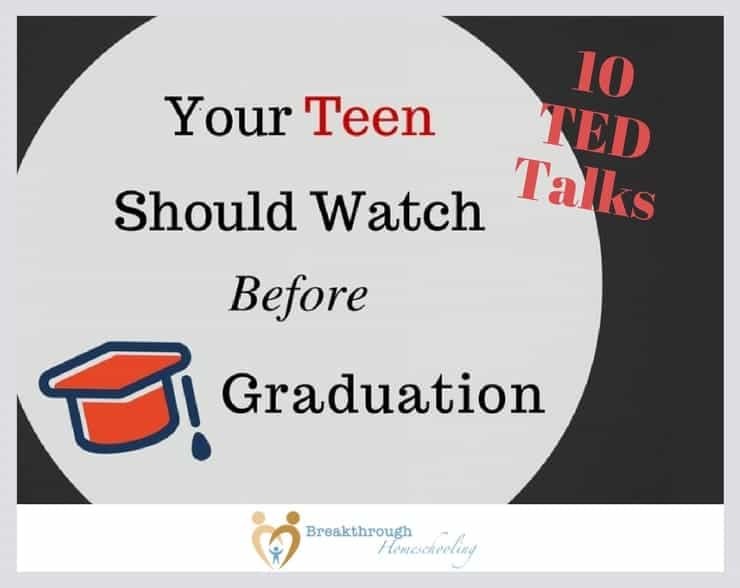 These are some great Ted talks and I use many of them with my senior class throughout the year. I also add my favorite lecture by the late Dr. Randy Pausch titled the Last Lecture.